(or the 'quarium as Master J would say) which is one of the best Aquarium's in the world. They have the most amazing sea life there and lots of opportunities to touch and learn. 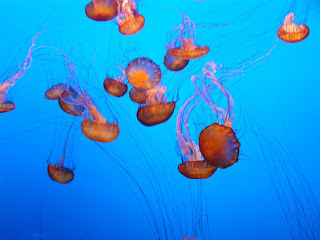 One of their best exhibits is the jellyfish exhibit. They have all sorts of jellies and have them in tanks with lights that make them look so incredibly beautiful. It is really a sight to behold. 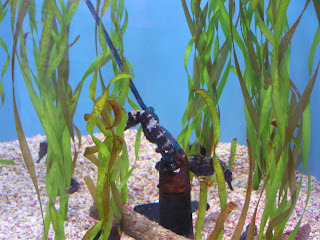 Also they have many amazing creatures such as the seahorse pictured here. Of course no trip would be complete without a trip to the yarn store so Mom and I went to Yarn by the Sea, the yarn store in Carmel where they sell not only yummy yarn but designer chocolate! I mean what more could you want out of life? Now for the "no knitting content part". That was the only bad part of the trip. I had been scouting out photo shoot locations for various knitting projects and Saturday morning I packed up the projects, grabbed the camera and headed out the door only to - GET WET! Yes it had started raining, then pouring and it didn't stop! I was so disappointed!! 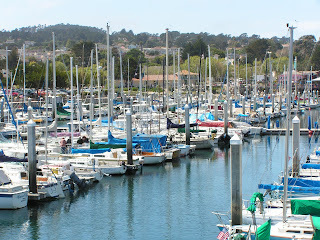 I was really looking forward to sharing pictures of "knitting by the sea." Oh well, I guess I'll just have to go back! I love your photos! I have to tell you: there's a shawl in my "Wrapped in Comfort" book that was inspired by a trip to the Monterey Bay Aquarium, and the main part of it is jellyfish. That picture is exactly the exhibit I had in mind as I made it. We were at the Aquarium on Monday during vacation week! We stayed down in Carmel. I'm still working on getting my trip report up. I have no pictures of myself or my knitting. I did knit, but then no one else took a picture of me. obtw, more of the oban in plum thunder finally came in. You are truely the best photographer I know...aquarium pictures are difficult...yours are fabulous! !